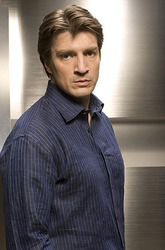 Fillion has been involved in TV soap operas like One Life to Live, traditionally distributed films like Slither and Trucker, Internet-distributed films like Dr. Horrible's Sing-Along Blog, voice-over work like the video games Halo 3: ODST and Halo: Reach, and the theatre. He has also been recognized for his looks in People and Entertainment Weekly. Fillion's public service work includes the co-founding of Kids Need to Read, an organization dedicated to getting more books into underfunded libraries.